The Cobra Can-Bus Alarm is perfect for protecting your vehicle. The alarm will only fully disarm once it see's the command from your original factory OE remote control. The system protects doors, boot, It can also protect the vehicles interior via ultrasonic sensors. 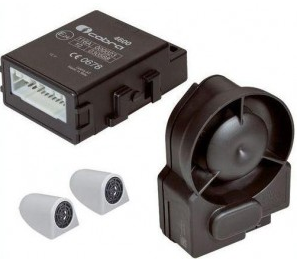 This system will sound a full 118db siren it also has a built in battery meaning it will still remain sounding even if the siren wiring is cut. The system will also flash the indicators in the event of attack. Fully Thatcham Cat 2>1 approved meaning, if fitted to any vehicle made after 1996 it will be a full Thatcham Cat 1 once installed. The Cobra can-bus alarm is the alarm of choice for customers wanting an OE style installation and wanting a sleek LED which doesn't look over the top. You also have the ability to add on extra's such as tilt sensors, glass break sensors and even link the system to a tracker if required. As usual with Cobra you get the 3 year warranty for piece of mind. We supply and fit the Cobra Can-Bus Alarm in Essex and all local area’s such as…. Basildon, Brentwood, Romford, Hornchurch, Barking, Dagenham, Ilford, Thurrock, South Ockenden, Billericay, Grays, Southend, Southwoodham ferrers, Chelmsford.